The two countries have been going at it, and the US has been involved in trying to have them stop, he said. Washington: President Donald Trump credited the US with helping to ease a rise in tensions between India and Pakistan as his efforts to strike a nuclear deal with North Korea collapsed. Tensions between India and Pakistan, both of which have nuclear arsenals and a long history of conflict, escalated this week in the most serious military confrontation between the two nations in decades. Indian warplanes struck inside Pakistan on Tuesday for the first time since the 1971 war between the two countries. 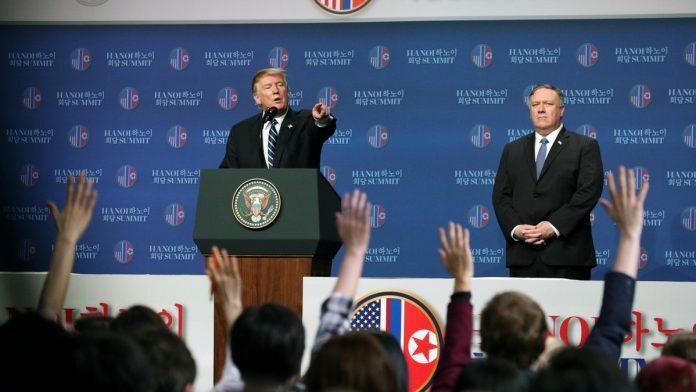 “We’ve been in the middle trying to help them both out, see if we can get some organization and some peace, and I think, probably, that’s going to be happening,” Trump said. The Indian government said the airstrikes targeted a training camp for Jaish-e-Mohammed, a terrorist group that killed 40 Indian soldiers in a Feb. 14 suicide bombing in Kashmir, a disputed territory that is a chronic flashpoint. Pakistan responded Wednesday by shooting down what it said were two Indian planes. Pakistan captured an Indian Air Force pilot and released video of the pilot being interrogated, complicating the domestic political challenge for India’s Prime Minister Narendra Modi as he faces a general election within weeks.